The National Hockey League announced today that Flyers goaltender Carter Hart has been named Rookie of the Month for January. The 20-year-old posted a 6-2-1 record to go along with a .931 save percentage and 2.33 goals-against average in nine appearances, all starts, on the month. During the club’s six-game win streak, Hart has backstopped the Flyers to five of those wins, recording a 2.38 GAA and .930 save percentage since his start on Jan. 14. His five consecutive victories made him just the 10th different goaltender in NHL history to record a personal win streak of five or more games before celebrating his 21st birthday (and first since Carey Price from March 20 – April 5, 2008). Not only among rookies, Hart tied for third among all goaltenders in wins (6) and T-7th in save percentage (.931) among netminders to play at least five games on the month. Hart received his first professional recall on Dec. 16 after going 9-5-2 with the Phantoms. 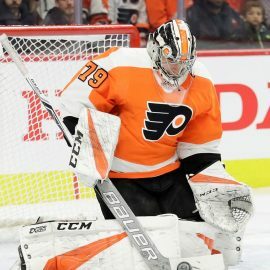 Since that point, he has made 15 starts out of 20 games for the Flyers posting an overall mark of 8-5-2 with a 2.48 GAA and .922 save percentage in 14 appearances.